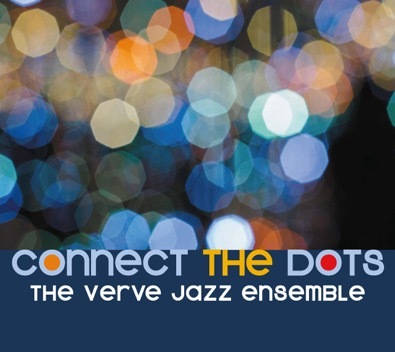 Always highly polished, the Verve Jazz Ensemble's timeless straight-ahead jazz reaches for exuberance as well on LightGroove Media's July 20 release Connect the Dots. 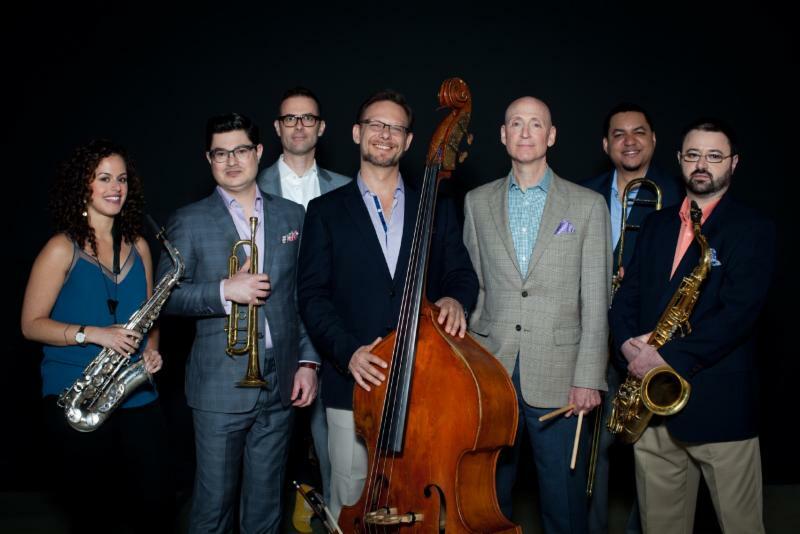 The fifth album by the VJE, a modular New York-based ensemble led by drummer Josh Feldstein, features upbeat performances of band originals, standards, and lesser-known works by classic jazz composers -- each characterized by the musicians' palpable delight in playing together. Connect the Dots also finds the VJE expanded to seven pieces, with alto saxophonist/flutist Alexa Tarantino and trombonist Willie Applewhite making their VJE debuts alongside the existing quintet of trumpeter/flugelhornist Tatum Greenblatt, tenor saxophonist Jon Blanck, pianist Steve Einerson, bassist Elias Bailey, and Feldstein. The exuberance is amplified by the tunes themselves: catchy melodies, imbued with deceptively rich harmonies and finger-snapping grooves. This, according to Feldstein, is part of the band's reason for being. "Beyond the joy of playing the music, one of our goals is to make the music more widely accessible," he says. "Brighter and with melodic and rhythmic structures people can immediately connect to, whether the listener is new to jazz or an aficionado." To that end, Connect the Dots includes new arrangements of some of jazz's most beloved standards -- Lee Morgan's "Ceora," Cole Porter's "Love for Sale," Harold Arlen's "My Shining Hour" -- alongside intoxicating originals like Feldstein and Greenblatt's lush bebop title track and Blanck's subtly funky "Autumn Left." However, the album also features "underserved" tunes by jazz royalty of the likes of Benny Golson ("Little Karin"), Stan Kenton ("Intermission Riff"), and Gerry Mulligan ("Disk Jockey Jump"). Here too, says Feldstein, is one of VJE's missions: "To find music that is fresh, with melodies we love, and blow the dust off it. There's so much amazing music that people haven't heard." Josh Feldstein, Willie Applewhite, Jon Blanck. 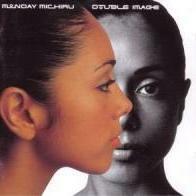 The full septet appears on four of the album's 13 tracks. The remainder feature three different quintet configurations, as well as trio settings for Einerson, Bailey, and Feldstein. The drummer, along with Greenblatt and Blanck, contributed the arrangements for these configurations as well as providing the original tunes. 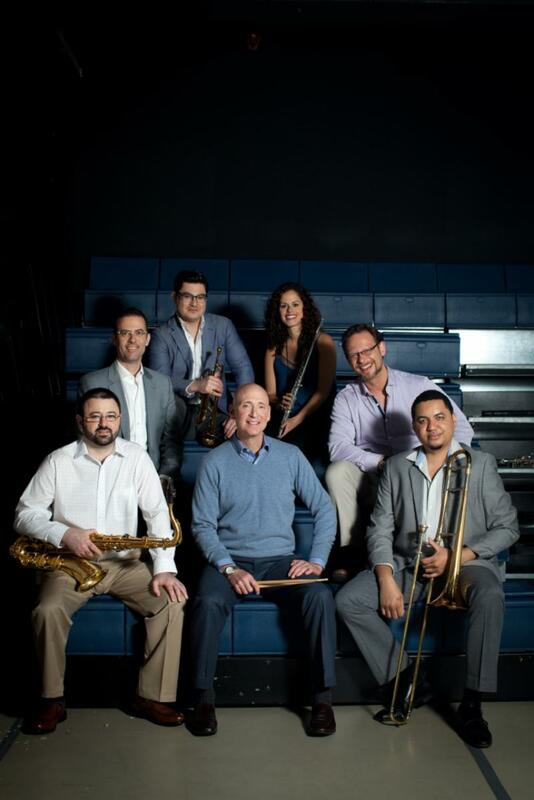 The Verve Jazz Ensemble is the brainchild of Josh Feldstein, born and raised in New York City. He began studying drums at 11; a year later, his drum teacher told him that Josh's drumming style reminded him of Gene Krupa. Josh immediately immersed himself in the recordings of the legendary "Sing, Sing, Sing" soloist. That was it: At a time when most of his friends were listening to pop artists like Elton John, Stevie Wonder, and Michael Jackson, Josh "withdrew into jazz." Through junior high and his years in Queens at Bayside High School, Josh continued his drumming. He attended Queens College where he got his undergraduate degree in English. Later, while living with his wife in DC, and after they moved to Connecticut, Josh continued sitting in at local clubs. A turning point came in 2005 when Josh saw a recent West Conn jazz grad named Jon Blanckperform. Impressed with Jon's playing and musicianship, he introduced himself to the young saxophonist, and soon struck up a great friendship and musical connection. Together with bassist Chris DeAngelis, they formed a trio that became the core of the Verve Jazz Ensemble-- a name Josh chose to express his love of the music and the recording legacy put out by the storied jazz label. The band's lineup steadily evolved from their 2013 debut, It's About Time, a quintet outing that included the VJE debuts of New York's Tatum Greenblatt on trumpet and Matt Oestreicher on piano. East End Sojourn followed in 2014, with Elias Bailey taking over from DeAngelis on bass and Oestreicher alternating with Steve Einerson. The latter became the sole pianist on 2016's Perimeter (a breakthrough for the VJE, featuring five original compositions along with their usual well-chosen tunes). Their fourth album, Swing-A-Nova (2017), a trio feature with three tracks adding Greenblatt on trumpet, reached #6 on the JazzWeek radio charts. Now, with Connect the Dots, Alexa Tarantino's alto saxophone and flute and Willie Applewhite's trombone fill out the VJE's exhilarating classic jazz sound. The Verve Jazz Ensemble, featuring the entire septet, will perform a CD release show at Club Bonafide, 212 E. 52nd Street, NYC, on Saturday 9/29, 8:00-9:15pm. This would be something like what Blue Note did around 1989 with younger players in Out Of The Blue, right? Ted, I'll ask my contact. When my copy arrives, I'll see what the liner notes say. I note that this is on the LightGroove Media label. Ted, my contact says that their use of the word Verve is, as said above, "a name Josh chose to express his love of the music and the recording legacy put out by the storied jazz label." I wonder if Verve will object. Certainly confused me. I thought it was attached to the label. I believe the Resonance Ensemble started before Resonance Records. It’s possible — and I’m speculating — that the Blue Note has BN’s permission. It’s also possible that the club doesn’t need BN’s permission because they’re involved in different classes of trade. Agreed. Also, being old enough, I recall the late '40s/early '50s radio show "Casey Crime Photographer", where the hero would retire to Club Blue Note (Herman Chittison, house pianist) for a beverage after solving another crime. That's 70 years ago, and there was a Blue Note record label then. The wit of Americais on Verve. I remember that Shelly Berman was on Verve. Jonathan Winters? Mort Sahl? Anybody else? Jazziz Magazine has named this cd one of July's Top Ten most exciting new jazz releases. I'm really liking this one. It's the only cd I've played since the 1st!